A very exciting sofa in red leather. 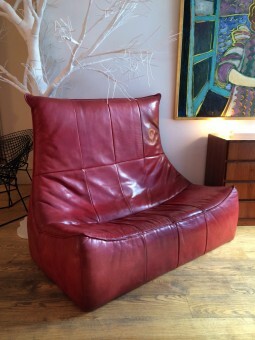 It was designed by the Dutch designer Gererd van den Berg in the 70s and made by his company - Montis. This is the only red one I have ever found. The leather is also much thicker than usual, being buffalo hide and cut from the neck area where it is thicker and more supple. It has been well used and has developed character and good patination. The measurements are 57 inches wide (145 cm), 35 inches deep (89 cm) and 45 inches high (115 cm).